Many thanks to the reviewers of the book: Jan Koehnlein, Henrik Lindberg, Pedro J. Molina, and Sebastian Zarnekow! I would also like to thank all the people from Packt I dealt with. This entry was posted in Uncategorized and tagged dsl, eclipse, xtend, xtext on August 25, 2013 by Lorenzo Bettini. I got the book a couple of days ago and I have read the first eight chapters. I would definitely recommend it to get started with XText. Chapter 7 on testing is illuminating, and there are a few real gems like the “Digression on Xtext grammar rules” in Chapter 8 . Bravo Lorenzo and thanks for the great work! To make one thing clear: Xtext is definitely not out, nor is the book. It’s both mega-in!! My compliments on the book. 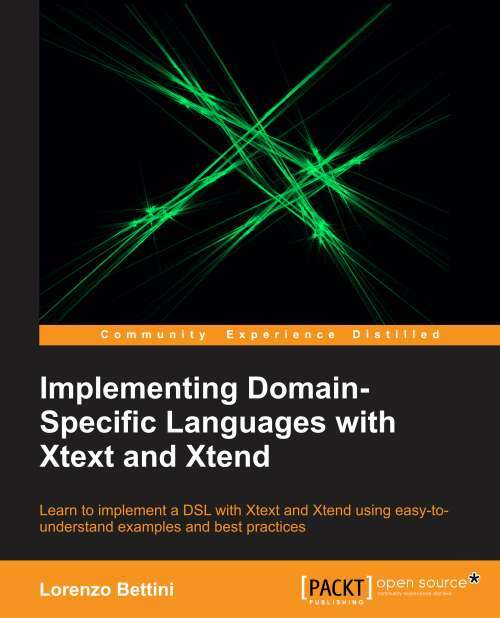 It was very useful in getting a better understanding of the possibilities of the xText framework. I first read it cover to cover and then applied it to some sample projects. Learned lots from it. Thanks again for writing it. If I may, I also have a question: Looking at the Xsemantics documentation, I have a hard time understanding the symbols like |- , ||- … Is there a standard/reference/theory that you could refer me to to explain their meaning? Concerning Xsemantics, you need at least a general knowledge of type system formalisms. A nice book, which has also a very pragmatic view, on type systems is http://www.cis.upenn.edu/~bcpierce/tapl/index.html by Benjamin Pierce! I will write that review! Thanks for the link to the book. I’m now waiting for the mailman to deliver it. Can you do that on amazon? I’m investigating about reviews on packt website..